October 21, 2010 – Avidyne Corporation, a leading provider of integrated flight deck and safety systems for general aviation aircraft, and Jeppesen, the leading global provider of integrated aviation information solutions, announced that Avidyne’s Entegra Release 9 and Entegra Multi-function Displays (MFD) customers who have CMax Chart subscriptions can now download a free version of their same charts subscription for use on an Apple iPad. “Avidyne and Jeppesen recognize the situational awareness benefits of electronic charts in the cockpit, and a large percentage of our Entegra Flight Deck and EX-Series MFD customers fly with CMax Charts,” said Patrick Herguth, Avidyne’s Chief Operating Officer. 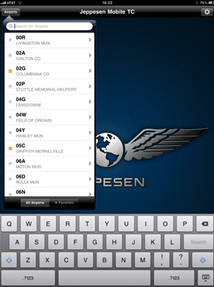 “We are delighted to offer our customers this valuable Jeppesen iPad solution that provides a redundant, safety-enhancing piloting tool.” Jeppesen Mobile TC is available for free download for the iPad at the Apple App Store. Charts subscription services are available through Jeppesen. Each paid subscription includes four ‘seat licenses.’ Typically, a pilot will dedicate one for their panel-mounted MFD, one for use on their home computer, and one for a laptop, leaving one which can be used for the iPad. CMax™ is Avidyne’s innovative implementation of Jeppesen’s JeppView U.S. and European Electronic Airway Manual chart service, which is hosted on Avidyne Entegra Release 9 Flight Deck displays and on EX-Series Multi-Function Displays (MFD). CMax displays electronic terminal/approach charts and airport diagrams on Avidyne MFDs, including an overlay of the pilot’s flight plan and present position. CMax provides on-demand access to the worldwide library of JeppView electronic charts and airport diagrams and dramatically improves the pilot's ability to manage cumbersome paper charts. CMax reduces the amount of paper required on the flight decks of Avidyne-equipped aircraft. In addition, CMax makes managing and accessing flight critical information more efficient, while eliminating the need for pilots to file traditional revision updates in their Airway Manuals. Avidyne’s continuing leadership in innovation and its Flying Made Simple™ system design make flying safer, more accessible and more enjoyable for pilots and their passengers. The company’s expanding line of products include the industry-leading Entegra integrated flight deck line for new and existing aircraft, datalink-capable EX5000 and EX600 multi-function displays and the dual-antenna TAS600 series of active traffic advisory systems, the MLB700 broadcast datalink receiver, the MLX770 world-wide datalink transceiver, and the TWX670 Tactical Weather Detection system. Headquartered in Lincoln, MA, the company has facilities in Columbus, OH, Melbourne, FL, and Boulder, CO.